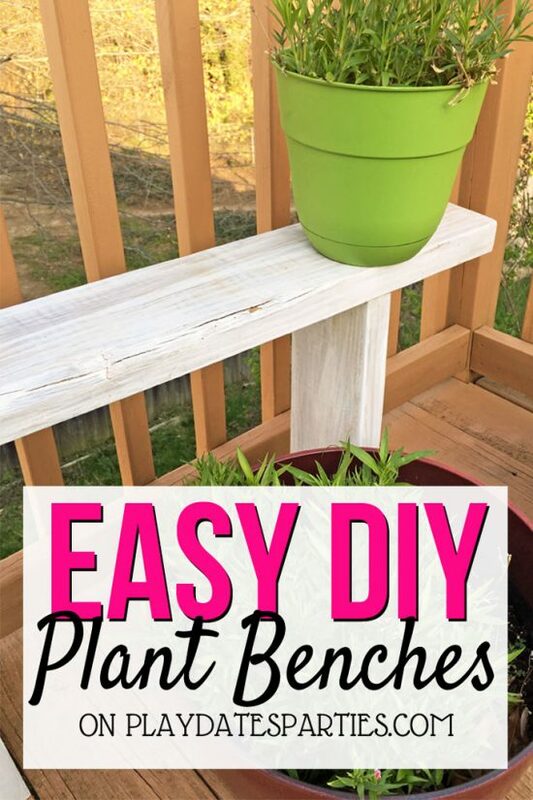 Don’t throw away that old rusty outdoor furniture! 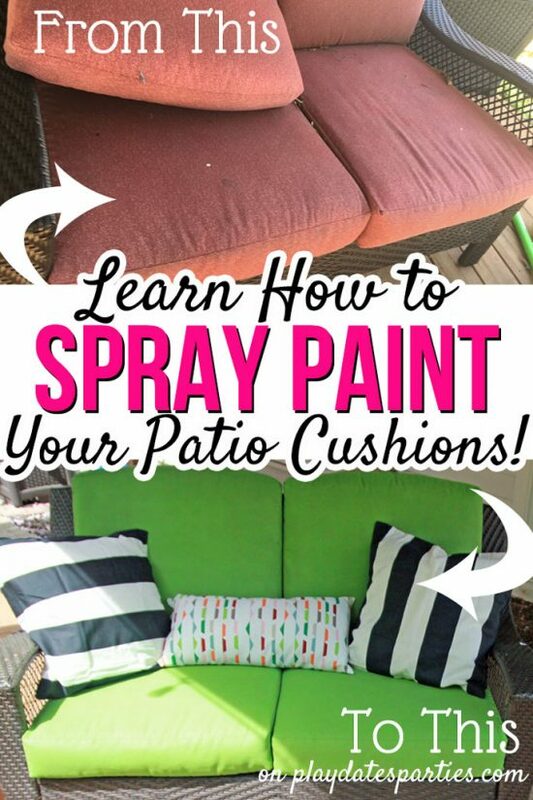 Find out how to paint rusted patio furniture to make it like new again! Temperatures aren’t much above freezing around here, our next few weekends are filled with activities and I just signed myself up for a MASSIVE six-week challenge – the One Room Challenge (ORC) to be exact. In a nutshell, the ORC is six weeks of intense renovation/redesign of a single room in your home. The goal is to share progress and inspiration along the way…all leading up to a gorgeous reveal at the end! 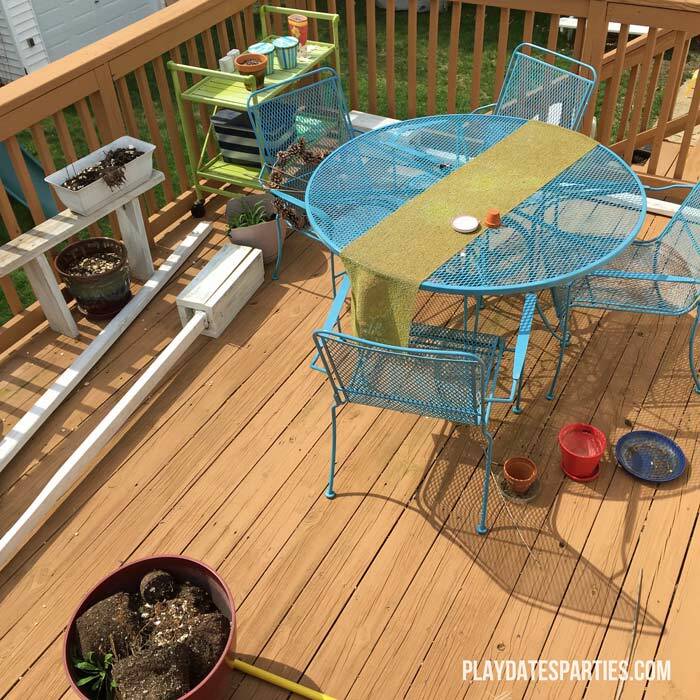 The problem is, I didn’t sign up for just one room…I signed up to do both of our back decks. That means not one, but TWO living areas. Right now, the upper deck (right off of our kitchen and dining area) is a mess of pots that were left out over winter and an unfinished project from last year. The yard overall also needs just some general sprucing up. Thankfully I did a lot of work while I was pregnant last spring. And the very first thing on my list was to renovate our cheap old rusty dining set. I think at least half of the homeowners out there start off with a set like this. We bought it the first summer we were living in this house, and had spent most of our cash furnishing the place with important things like bedrooms and dining rooms. Pinterest didn’t exist yet, so we just went to our local Lowe’s and picked out the cheapest, easiest set we could find. We didn’t really do anything to protect the set over the years, and the elements had definitely taken their toll, leaving a rusty mess. *I found that a table and four chairs took at least 3 cans of Rust Reformer and about 6 cans of colored spray paint. Remove as much rust as possible with a wire brush. I used wire brushes that attach to a power drill. The brushes got caught sometimes and at other times it felt like the drill was going to get away from me, but it was the best way to scrub off some of the tough rust. Give the set another good cleaning with a soft scrub brush and the hose. Set up a large drop cloth with wood boards to raise the furniture off the ground. This help to keep the furniture from sticking to the drop cloth, and prevents missed spots due to wrinkles or debris. Already looking better after a good cleaning and a coat of Rust Reformer. 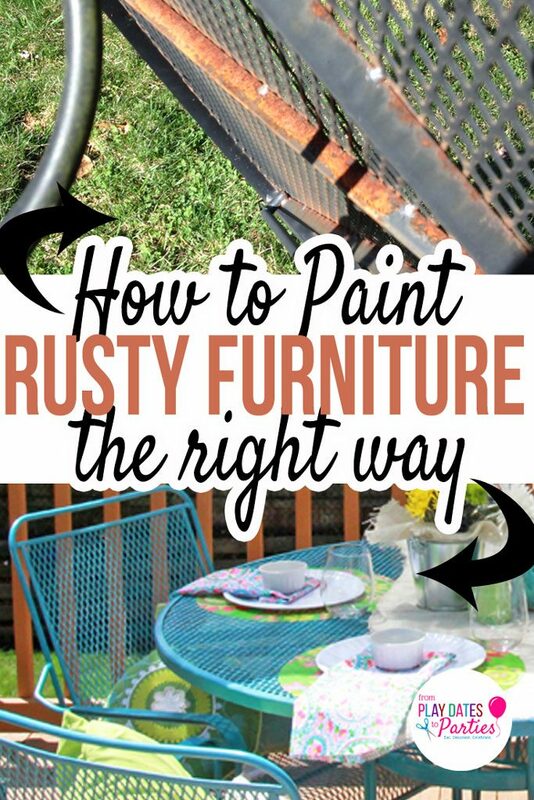 Spray any remaining rusty areas with Rustoleum Rust Reformer. This will help encapsulate the rust and prevent it from coming through the new paint color. 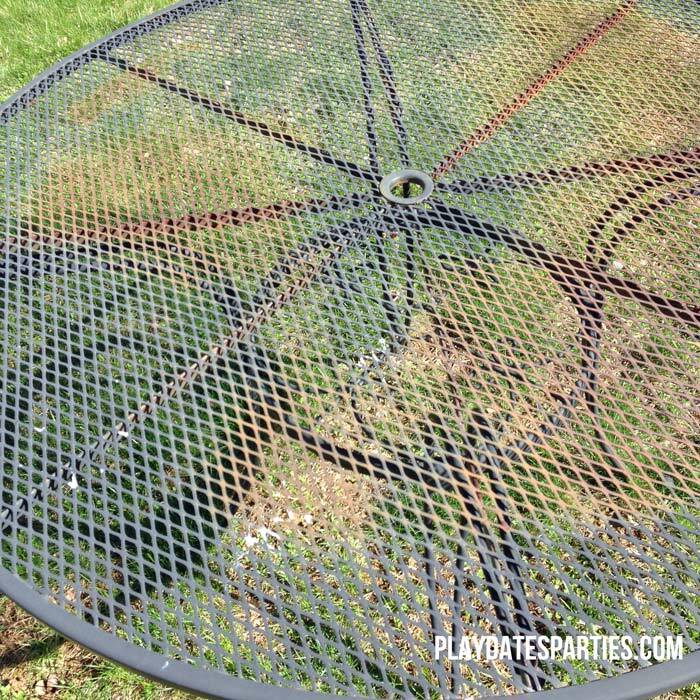 When the rust reformer is dry, spray paint the set with your preferred color. 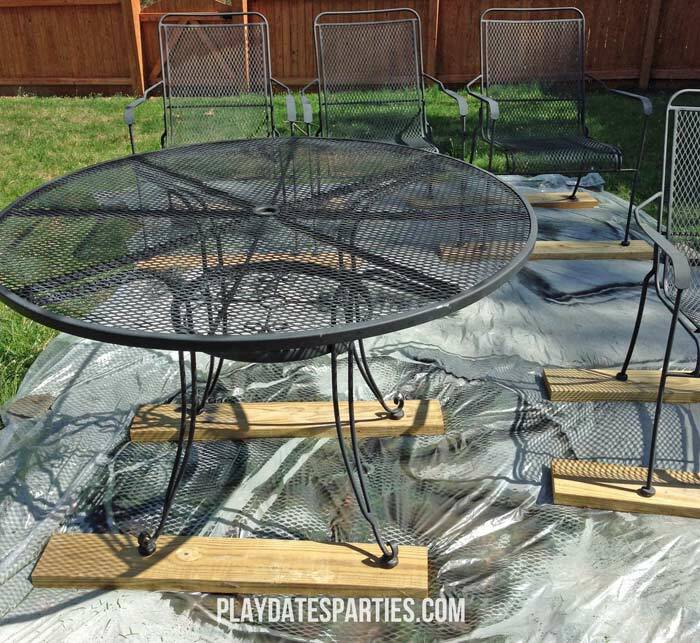 Use several coats of light spray paint until you get the set completely covered. Enjoy your new dining set! This project took me a few days to complete, but I wanted to make sure it was done right. Our family is already too big for this set, but we want to wait as long as possible before replacing it. Heres a shot of it now after sitting in full sun throughout the summer and winter (please pardon the mess, clean-up is first on the to-do list). And all decked out, ready to party! That’s a lot to get done in 33 days. It’s time to get started! 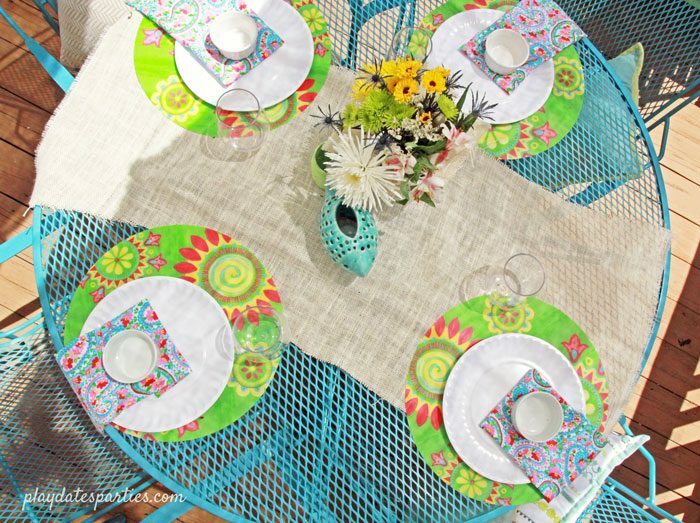 What’s your favorite way to get your outdoor space ready for summer entertaining? Consider me completely impressed. 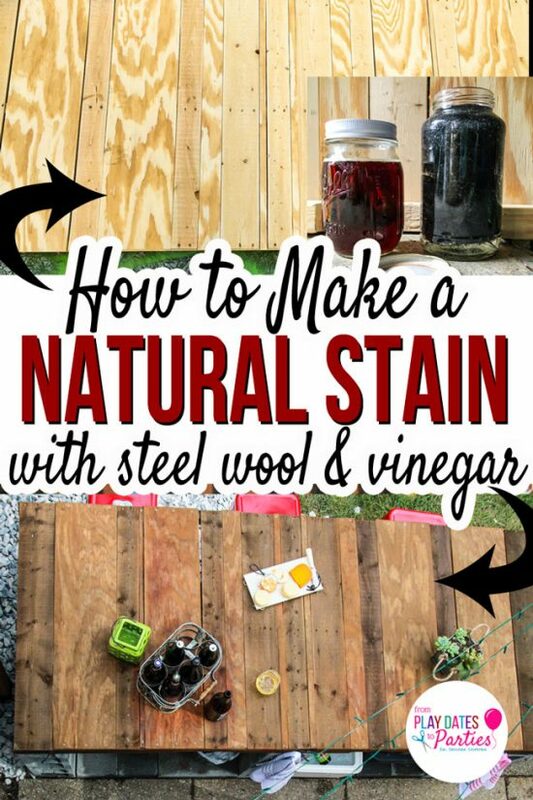 It’s so tempting to just junk the rusty furniture, but yours looks fresh and new again. The Husband was ready to drag that set to the recycling center, but I knew it still had some life. At some point we’ll have to get a table that fits all five of us, but for now we’re enjoying the colorful change. 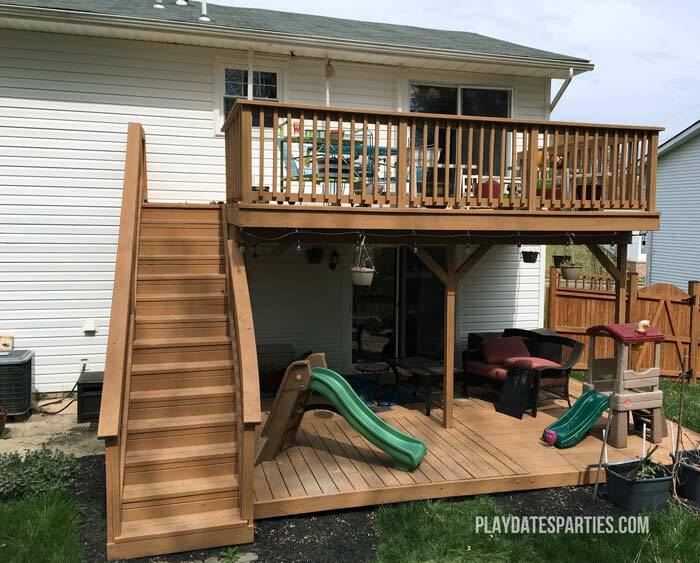 Such a cool deck space!! But you are doing double : ) Oh Boy! 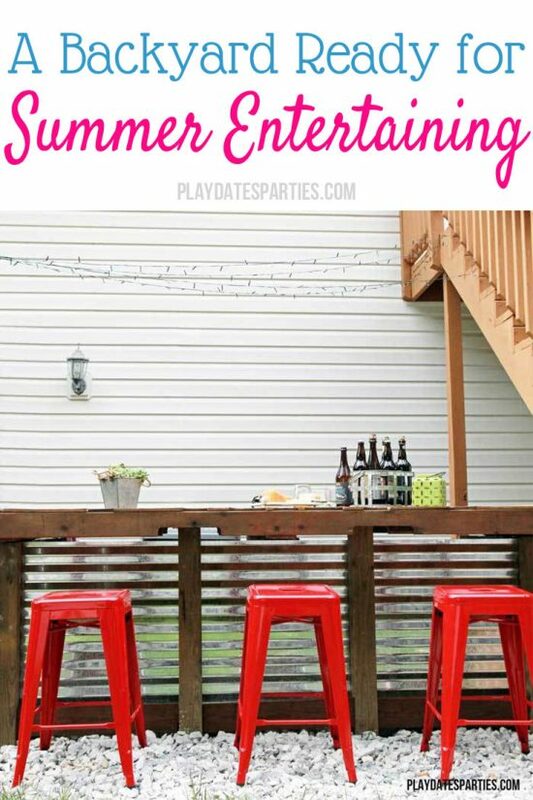 Such a great tip for the metal patio furniture! I have a piece I am wanting to use in my own ORC and I am going to be using your method, thanks so much! OH MY GOSH! You know how you don’t realize you need something SO much until you see it. THAT. WITH THIS POST. My poor outdoor furniture has taken a pretty bad beating. 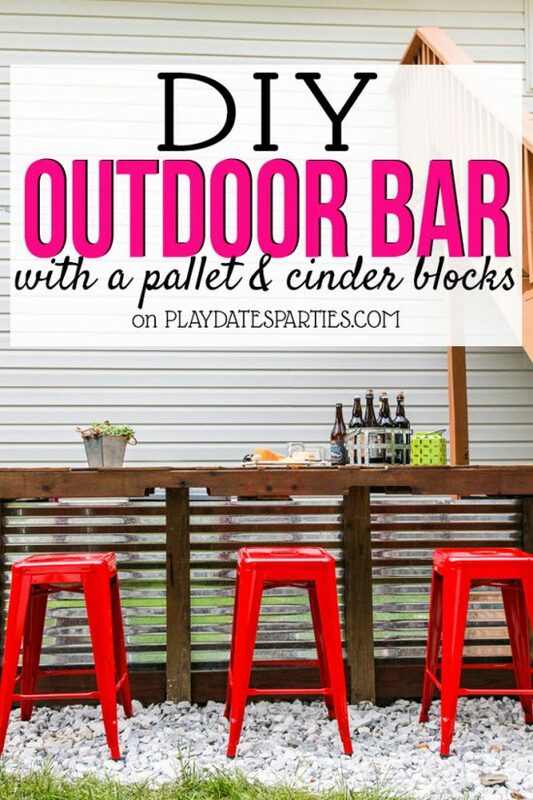 I know I am terrible at DIY but this seems manageable as long as I put my brain to it! this is a real nice way to update your table, and a great way to start the challenge. good luck with the double level, hopefully the weather will remain workable….before the mosquitoes arrive! Well hey now! Seriously Leslie I’m so impressed with all your DIY creativity. If it were me I wouldn’t have known what to do with that table set! I love the bright color! Our 20+year old deck was just torn down and the new one should be done next week. I’m so excited to buy furniture and furnish it so that it is a usable, comfortable space. 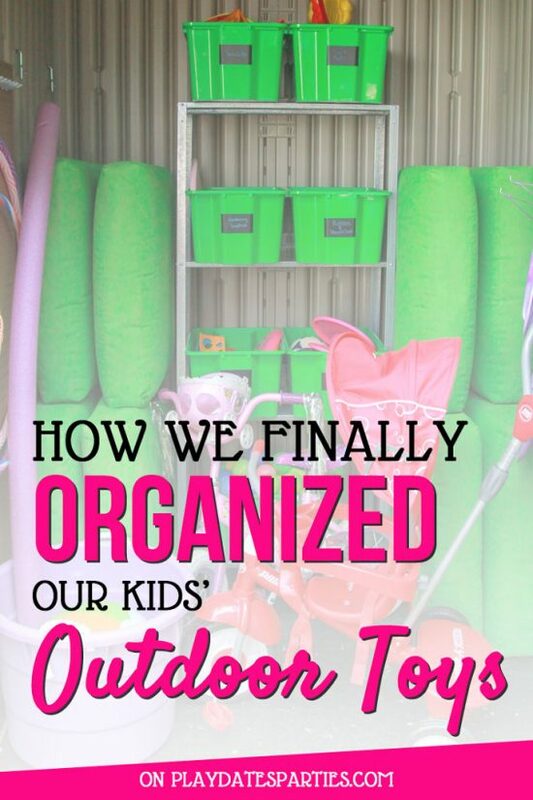 Can’t wait to see how your project turns out! The table looks great and I can’t wait to see what you do with the rest of the space! Thanks! It’s coming along slowly, but there are LOTS of changes happening! So glad I saw your post this morning! I am in the process of removing rust from an old table and am halfway there. 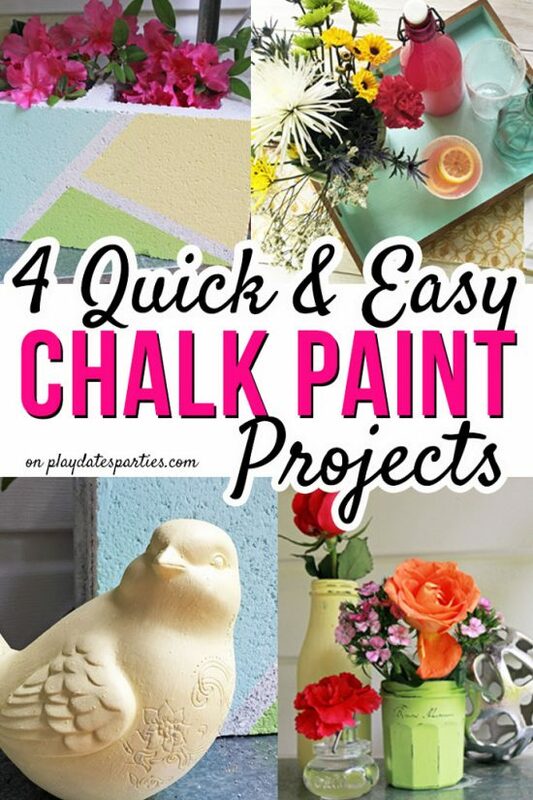 Just need to find the right spray paint – thanks for the tips above! This will help me move onto the next stage 🙂 Great post! I definitely recommend using the Rustoleum spray paint formulated to encapsulate rust. Otherwise, it might eat right through the new paint. It adds a couple more steps, but I can honestly say that our furniture doesn’t show any signs of the old rust even after being outside for a year. I love the color you chose! My mama told me about Rust Reformer but I haven’t used it as a primer of sorts before. Good tip! It looks lovely. I like the color very much. I’m not so afraid of the rust anymore. I won’t be shying away from the rusty furniture at garage sales! The color you chose is one of my favorites. It looks great! The furniture looks so much prettier now, I love the new color. We don’t have a patio or patio furniture, but we do have some old beach chairs that probably could benefit from a similar treatment. Thank you for joining The Really Crafty Link Party. Pinned! I love that turquoise. Thanks for sharing. Pinning for spring when I need to get to some painting. Blessings! I have couple chairs need to be redone. Using drill beats all the scrubbing with a wire brush. 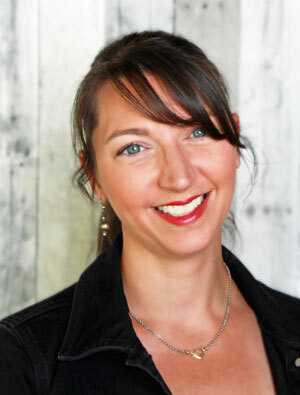 Found you on Simple Homestead Link Party. Rustoleum is such great spray paint! Thanks for sharing with SYC. It’s an amazing transformation. I’m interested to know how the paint job has held up in the two years since you originally wrote the post. Great question! The patio set sits in full sun ALL year long, so the paint is a bit faded, but no rust in sight! Thanks for stopping by! What a great way to bring new life to an old set! 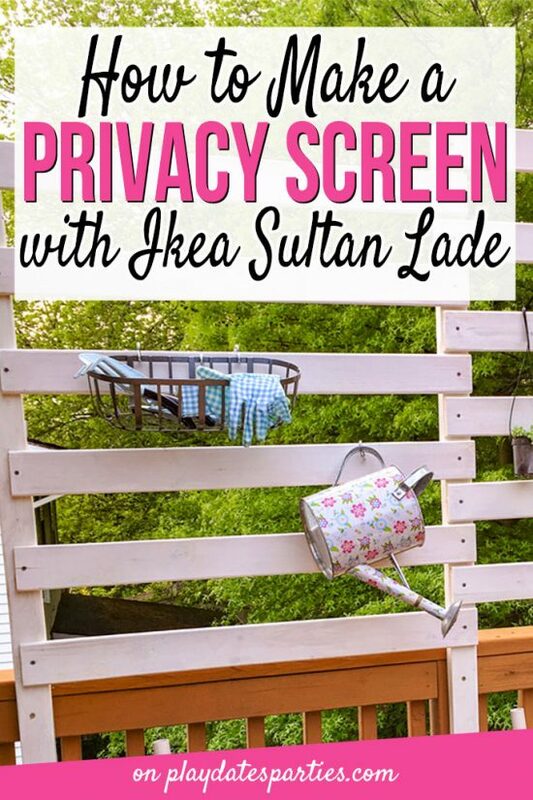 I am on the look-out this year for a patio set for our back deck. I think I’ll set my sights on a set that needs some TLC. Great tutorial! Thanks for sharing at Party in Your PJs! Hey Leslie – thanks so much for linking up at #TuneInThursday last week. I have chosen to feature your post tomorrow at the linkup.